September 01, 2017 by Caitlin Rosberg in what is caitlin reading? It has been A Week for a variety of reasons, so I'm going to keep this short and sweet. I finished Princess Jellyfish Volume 5 from last week! It was good! It always is. I read Mage: The Hero Denied #1 and did a full review over at the A.V. Club. It was bad, and you should definitely not bother. 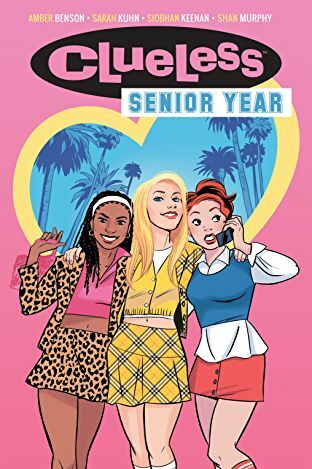 Clueless: Senior Year by Amber Benson, Sarah Kuhn, and Siobhan Keenan. This was freaking cute as hell, in the same way Princess Jellyfish is. I love books where people are, at the heart of things, supportive and loving, and not afraid to show that. Having met Amber and Sarah (they're both adorable and kind and charming!) I'm not surprised I loved this book. But maybe maybe more importantly, this book addresses some of the things that annoyed me in the movie (there are LGBTQ+ couples!) and is beautiful to boot. It did make me miss Brittany Murphy a bunch, and miss my own innocence when I didn't know anything about Alicia Silverstone and Stacey Dash as people. Go buy it immediately. Then go buy Sarah's Heroine Complex and Heroine Worship because they're both awesome. The Dispatcher by John Scalzi. Technically I listened to the audiobook (narrated by Zachary Quinto, who does a good job) of this novella this week in an attempt to avoid the news for a little while. It's a good speculative fiction story set in Chicago, and unlike a lot of books it actually feels like it. The "what if" is a fascinating one, and I don't feel like I can say much without spoiling it, but it's a solid little mystery with a compelling core idea. Jonesy Vol 1-3 by Sam Humphries, Caitlin Rose Boyle, and Brittany Peer. This was actually a re-read because I've been buying the individual issues of Jonesy as they come out but the arrival of the trade paperbacks made me crave it. Another bright, poppy story about a young woman and female friendship and embracing your weird. Clearly I was on a roll this week, between this, Clueless, and Princess Jellyfish. Sam is awesome and knows how to write flawed characters that are still sympathetic. Caitlin's art is fun and evokes all sorts of zine memories for me. And Brittany (who participated in Ladies' Night Anthology years ago) makes the whole book pop off the page. I really love this book and I'm so glad I have extra copies to lend out now. Full disclosure, I did get the copies of Clueless and Jonesy from BOOM!, but honestly I was planning on buying them. Let's talk about how 16 year old me would be horrified by what I read this week, and how 32 year old me really does not give a crap and would tell 16 year old me to lighten up and have fun sometimes. I started compiling a list of all the webcomics I read regularly and honestly ever 45 minutes I was only about half done. I wanted to make sure every single one had a working link in it and also 1-2 sentences describing it, and hopefully I'll be able to finish up soon...I read a lot of webcomics, folks.